I could not resist these jelly shades from L'Oreal when I found them at a local discount store. Although they are from last year's, they look perfectly spring-y to me even including a sheer "Radiant Orchid" shade. I had put them aside for a while due to this endless winter, but I finally felt like wearing something other than deep saturated vamp color on my tips. 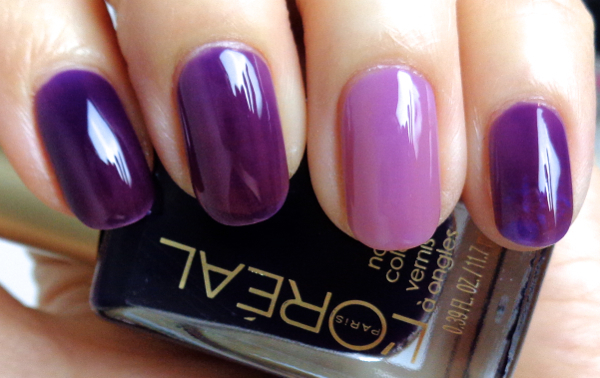 I tried this simple accent jelly mani using Berry Nice (607) and Lilac Cooler (606). The bottle colors are quite deceiving since they have this sheer jelly like consistency. You would probably have to put on 5 coats to achieve the opacity. Before this mani, I attempted a pointy mani for the first time in my life, which was enabled by my hectic schedule that didn't allow me a weekly mani and my freakishly fast growing nails. I used Butter London Scoundrel (another great "Radiant Orchid" shade with a bit of haze) and topped it with L'Oreal Lilac Coolers. It was actually perfect because Lilac Coolers added a light and bright touch to the finish otherwise that would have looked rather heavy. While it was fun (and secretly empowering) to have pointy nails, it wasn't very practical. For one thing, I was kind of hurting myself (um, when I was scratching myself). I also ended up tearing one of my daily contacts. And, to be honest, the temptation of poking annoying people with my nails, was too great. I still love square nails with slightly rounded edges (which is my signature nail shapes), but I wanted to try oval mani this time as it seems very much in for this season. This is with 3 coats of each color. 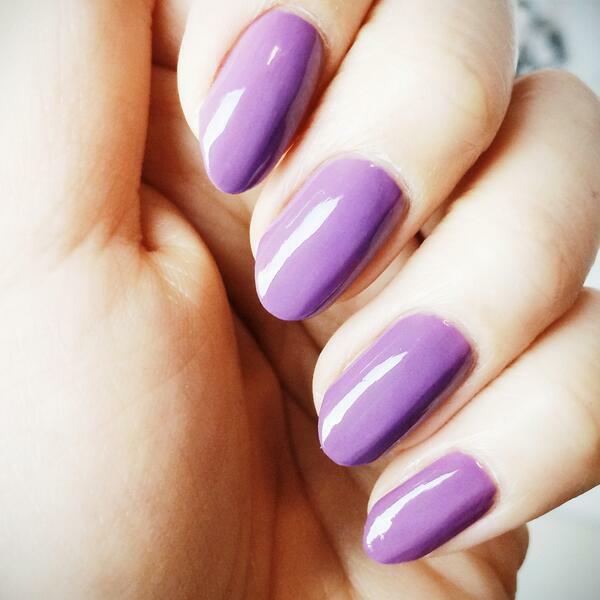 Berry Nice does not look vampy nor scary as the bottle might suggest, and Lilac Coolers is much pinker on nails. 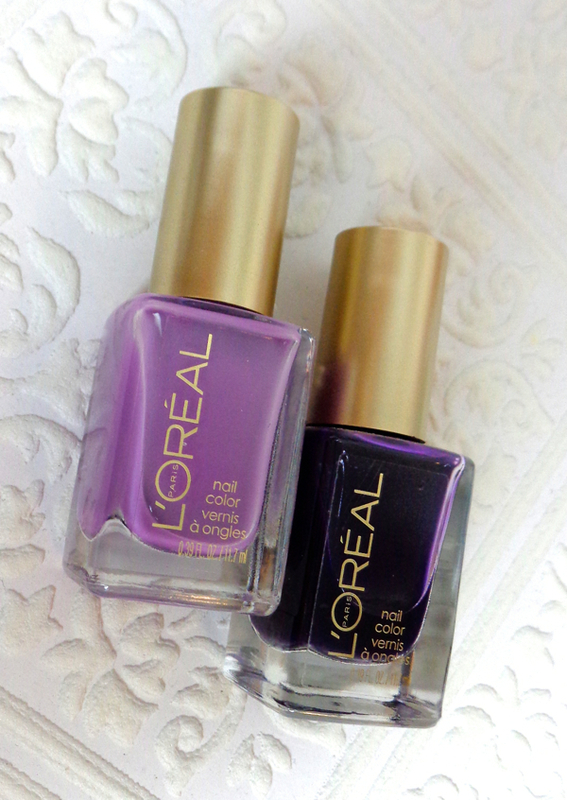 The formula of L'Oreal Nail Colors are rather excellent in my opinion especially considering that they are 5-free polishes. Usually jelly shades are tricky to apply, but that is not the case, either. The wide yet rounded brush shape works very nicely even on my narrow and curved nail beds. I think it is best to wait a couple minutes before applying a fast drying top coat on these jelly polishes because that would most likely cause cuticle drag and shrinkage. These colors wear very well and I do like this sweet color combo, but I am so going back to dark vamps today. This snow and hail mix in mid April is a total insult to my spring nails. Ugh. Have you tried nail polishes with sheer jelly finish? What are your favorite nail shapes for mani? Hey Lena, OOO look at the JELLY!!! It's amazing how it seems to be pretty opaque as well! In that case, I'm totally in! With 3 coats, you still see a bit of nail lines in the sunlight, but it covers pretty nicely. these shades are so pretty. Scream spring colors. Yes, I know, the snow/ice pellets we got here yesterday is such a hard blow as all the snow in the backyard finally melt and now we are stuck with a new pile. When is spring coming? Thank you! I totally agree that these colors are perfectly cheerful for spring. I love the look of jellies on others but never feel compelled to get a shade for myself. I think I have an OPI but it probably doesn't look as juicy and squishy as this! Oooh, beautiful! I love jelly shades, although they are sometimes finicky and hard to work with. If it's easy, I'm in! HAHAHA. I like that Lilac shade a lot! And yeah-it's cold here too! And it snowed. AGAIN. Winter just won't quit! These are pretty! I find jelly polishes tricky. Some of them don't need top coats. They are tricky indeed! I still like adding a top coat to ensure a longer wear. I need to be careful with shrinkage, though! Oooo wow! They are soo glossy and jelly looking! I just walked past the entire display of these today in the drugstore but I'm not done with my current school course yet and can't have manicures yet! When I'm done I'm going to be rocking some jelly polishes! Those are so shiny and nice!! Not sure which shade is my fav. I'll have to check these out next time I'm at Target. My fav nail shape for a mani is square, with rounded corners/edges. This is really pretty! Love these shade together! Never tried a jelly finish polish, but your post got me curious. the shades are so gorgeous, Lena! The finish is so shiny and the colours just compliment your skintone <3 Discount store?! How much do they retail for usually?